MAC Cosmetics are the one brand you can always count on to keep your beauty bag in check. 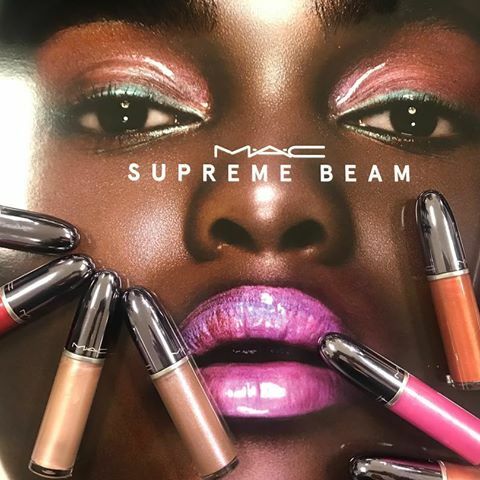 With frequent new releases of beautiful colours and formulas, it's hard to ever get bored of being apart of the super fun world that is MAC. MAC launched two new collections recently, with the first being the Dazzleshadow Liquid eye colours. Available in a range of shades and textures, from subtle sparkle, to glitter and chrome these are a great foolproof product for someone on the go. Upon first use, I did find that one of the colours in particular you can't blend it too much or the product does start to pull away. This is one reason why I normally don't use many liquid eye colours, because I just find they are a little mucky to achieve your desired look. After many attempts I found the best way was to do the rest of my eye look first and then add the Dazzleshadow last, using my finger to softly blend it into the other shadows. The other formula that I was kindly sent I had no issues with! The second collection to launch this month is Supreme Beam. This collection again is super fun with lots of quirky colours and textures, that make being creative super easy! Lucid, holographic colour transfixes on lips with 10 new shades of Grand Illusion Glossy Liquid Lipcolour $50. Get your angelic aura on with 4 highlighting hues of Hyper Real Foundation $72, back by popular demand and transmitting a pearly gates flow. Then light the way to divine luminosity with the intense sheen of Iridescent Powder. This collection is all types of fun and I was so so excited to see the Iridescent powder $60 in Silver Dusk make a return, as back in the day it was one of my fave products!! I love using it to blend right over the cheekbone for an all over glow, rather than the stripe of product you normally see when highlighting the cheekbones. I also love tapping it onto the centre of the lid when creating a soft smokey eye, it adds an extra little something without being too over the top. Breaking the perception on guys getting skin treatments!